It's funny how quickly the air changes. Yes, I know, it really wasn't quick, it changes all the time, it's only my noticing that changes. First it's hot and it's dry and it's summer and each molecule is warmed by the sun, each particle on my skin feels like summer and hot. Like - hey, it's September, welcome. It is darker earlier. I did notice that several weeks ago. When the other interpreter and I were preparing for the interpreted performance of Twelfth Night in Bend. On Fridays and Saturdays we went to different wineries to see the play. Same show, different location, different days. And over those three weekends, the footlights came on a little earlier in the play than they had the week before. So I noticed the light shifting. Then the fourth week, in Bend, the lights came on at intermission. I see that our temperatures are headed back up for this weekend. And that's good. My tomatoes could use a few more days of heat, they are already slowing their production. I haven't had enough of the sweet, round, deliciousness. Each day when I pick the golden orange and red cherry tomatoes, half of them make it to the house. And I remember, again, why I don't eat fresh tomatoes very often at other times of the year. It is hard to find a tomato - cherry or full-size - at other times which taste as good as the ones I planted and tended and picked. And popped right into my mouth direct from the vine. So the air. Now. There are still waves and layers of warm. But the cooler bits are present as well. Heat layers warmth and dry puffs mix with molecules of wetter composition. I can smell it. I feel it on my skin. The calendar tells me it is still summer. 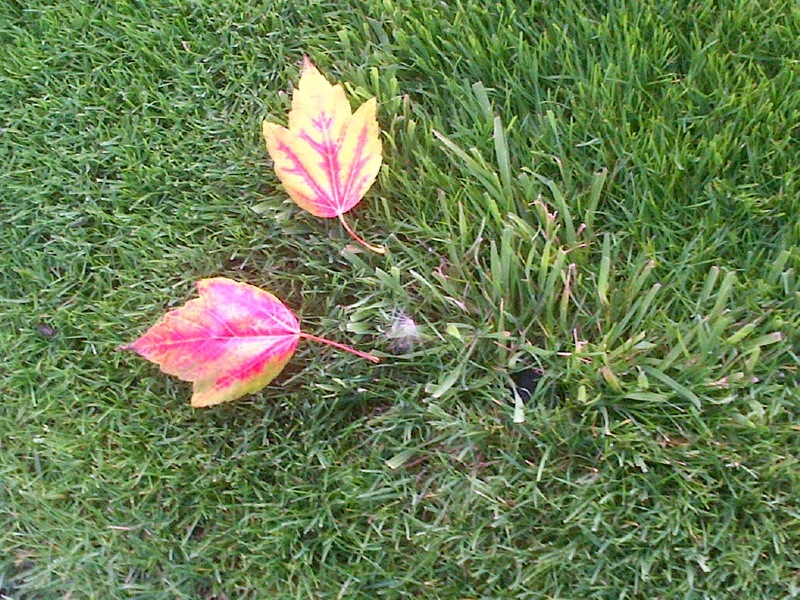 The leaves already beginning to fall tell me it is the edge of autumn. My skin says, stay present with whatever it is. Cool warm sun cloud water.